Butler County is working on replacing some moldy insulation found in the Butler County Courthouse. County Facilities Director John Campbell said the mold was found on the fiberglass insulation in the basement of the courthouse. No one currently works in that space. Workers were recently emptying the old law library when they noticed the mold. The county is also working on finishing the Butler County Government Center Annex building. The three commissioners unanimously voted to spend $30,000 for architecture work so the bottom floor of the building can be built out to house several county departments- including planning, tax assessment, mapping and tax claims. Those offices are currently in the Butler County Courthouse. The commissioners said the goal is to create a more efficient and collaborative space. The post Mold Remediation Underway At Butler Co. 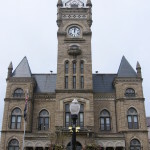 Courthouse appeared first on ButlerRadio.com – Butler, PA .